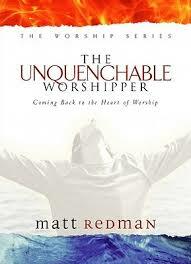 I recently read The Unquenchable Worshiper by CCM artist Matt Redman. I came away with a lot of good encouragement and many good points, but one thing really stuck out to me. In Mark 14 we see a woman break open a jar of expensive perfume and pour it out on Jesus. Understandably, everyone gathered around was outraged, for the perfume could have been sold and been of great value to the ministry. In his book, Redman talks about the greatness found in this act of worship. Jesus would certainly have understood it. See, much of Western Christianity worships in a controlled, predictable atmosphere. We call it different things: “seeker friendly,” or “accessible worship,” but it shows an underlying fear present in our church. We are scared to give up control. We are sorely afraid of the power of the Holy Spirit. Our sound technicians stay with fingers at the ready on the mute switch during a lay person’s testimony. The worship leader is given strict instructions about his words before or after a song set. We forget that the God we worship might want things done a different way. We become as the Pharisees and religious leaders of Jesus’ day when we do not allow the Spirit of Truth to speak to us in new and exciting ways. God, in your creative power, begin an unpredictable, uncontrollable work in this worship that will change our hearts, our minds, and our community toward Your Son, Jesus Christ, Who lives and reigns with You and the Holy Spirit, one God, forever and ever. Amen. I strongly believe what you said about us being afraid of the Holy Spirit. We want to be in control of everything including our worship. God condemned idol worship in the OT but He also condemned false, hypocritical worship of Himself. He accused Israel of going thru the motions. I wonder sometimes how acceptable our worship services are. Definitely! And all the production that goes into it can be awe-inspiring, but does it detract from God’s glory when we admire our own?